Many young cats and kittens (and even some older felines) love to climb trees and are naturally intrigued by anything new, bright and sparkly – so they’re probably going to be attracted to a Christmas tree covered in sparkly decorations in the corner of your living room. But aside from the obvious issue of your tree and decorations ending up on the floor, it can pose health hazards for your pet which are important to be aware of and consider. 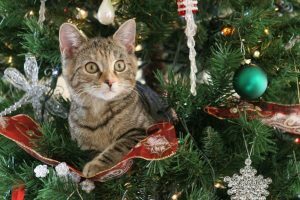 Christmas trees themselves, whether real or artificial, can be a hazard if your cat has a tendency to climb things they shouldn’t. The oils produced by some real Christmas trees are also mildly toxic if consumed, causing minor irritation to a pet’s mouth and stomach. Also be wary of using any fertilisers or plant food on your tree if it’s potted, as many are toxic to cats and can seep into watering trays. Don’t forget that containers with soil might also get used as litter trays! Additionally, there is a very small risk that sharp pine needles can cause internal damage if swallowed, or can get into eyes or ears – but cases are extremely rare. If you are concerned about this, and want to have a real Christmas tree, you could consider purchasing one of the non-drop variety. Tinsel and other hanging decorations can look just like cat toys. But there is a risk they might swallow them or even break glass ornaments, causing injury. Tinsel and angel hair in particular can cause serious illness if ingested due to the blockages they can cause, and in some cases this can even be fatal. Christmas lights can pose a real danger to cats if they decide to chew on any electrical wiring. Ensure you cover any exposed wires leading to the tree with plastic or cardboard tubes, and switch lights off at the mains when you’re not around to supervise your cat. Battery powered LED lights are also a good option instead. Cat owners should be wary of snow globes. Some of these festive ornaments can contain ethylene glycol, commonly known as antifreeze, which is highly toxic to pets. If the ornament breaks and the liquid spills out, there’s a real risk your cat could lick it up or swallow it whilst grooming – if it’s on their fur – and become critically ill. Be sure to check what chemicals your snow globe contains and keep it well out of the reach of any curious cats. Festive red lilies can be fatal to cats. Floral arrangements and festive plants are seen in many homes over Christmas, but there are a large number of plants poisonous to cats. Fortunately, most cats rarely pay them any attention. But young cats, and especially indoor cats, may through curiosity or boredom try chewing houseplants – so they are most at risk of poisoning. Poinsettia is often feared by cat owners but is, in fact, only mildly toxic to felines if eaten, causing minor stomach irritation. Berries including those from holly and mistletoe, are far more dangerous, as well as amaryllis plants. 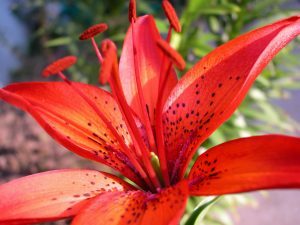 Meanwhile, even small quantities of lily leaf or pollen can be dangerous. Dieffenbachia (dumb cane or leopard lily), causes irritation of the mouth and can be toxic, as can all plants of the lilium and hemerocallis family (such as Easter lily, tiger lily or Oriental lilies). Please contact us promptly if your cat has eaten any poisonous plants. Christmas is a time of year when there’s plenty of kitchen activity going on, but be careful around your cat when you’re cooking – as they will be right behind you ready to lick up the mess if you spill something hot! Not only can this cause burns, but a number of foods are also toxic. 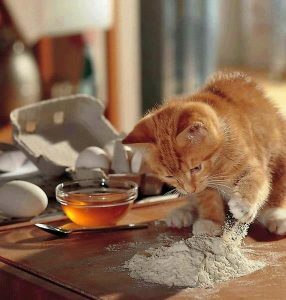 Cats can also jump up onto hot surfaces, so it’s best to keep your cat out of the kitchen altogether when you are cooking. Another serious danger to cats is meat string – any string is a real risk to cats due to the blockages it can cause in the intestine, but string laced with tasty meat juices provides even more of a lure to hungry felines! The ingredients of some human foods are toxic. Onions and garlic can sometimes be poisonous, whether cooked or raw – so don’t let your cat lick up gravy. Raisins, grapes and chocolate also pose a threat. Avoid feeding these at all, even in small quantities. Alcohol can be dangerous in small quantities so wipe up any spillages promptly. With many people reaching for the paracetamol after Christmas parties, it’s important to remember to keep any pills and medication well out of the way of cats as they can be extremely dangerous. Keep pills in a secure draw or cupboard and never leave any open packets lying around. What should I do if my cat has been poisoned? If you think your cat has eaten something dangerous, contact us immediately on 01727 226475 (phone the emergency number if necessary 01707 666399 ). Wherever possible have any packaging to hand so that you can tell the us exactly what the substance or food is. Or if you have seen your cat chewing something, take samples along. Do not try to make your cat sick without asking the vet. If your cat is staggering or having a fit, clear obstacles out of the way, and make the room dark and quiet. However, many illnesses can look like poisoning – such as kidney disease or severe gastroenteritis. Both of these can have a sudden start. Unless you have an idea of what poison is involved, it is not normally possible to identify it by taking samples from an animal. With so many visitors, change and new smells, Christmas in general can be a stressful time of year for cats, particularly nervous ones. Excessive cleaning and moving furniture about can disrupt your cat’s important marks of scent around the home, leading to anxiety. Other animals coming into the home may also be an unwelcome change to their routine. It’s therefore important to provide hiding places for them, a litter tray in a peaceful area, as well as a constant supply of water. Sprays or diffusers which release comforting pheromones may also help. If there are any new animals in the home, ensure they’re kept in separate rooms. And if you’re leaving your cat with a pet sitter or in a cattery over the festive period, be sure to provide them with up to date contact details as well as that of your vet, including the emergency service. Your pet will also find comfort in some familiar items such as blankets or toys if they’re staying away from home.